In some ways Esther's life is like any other American girl. Last night she danced around our living room singing into a marker along with the soundtrack from "Frozen." From what I have read on Facebook, that is fairly common these days. In other ways Esther's life is very unusual. Last week she learned to fetch water when we did't have running water. I baked my first cake from scratch at age 37 when we moved to Uganda. 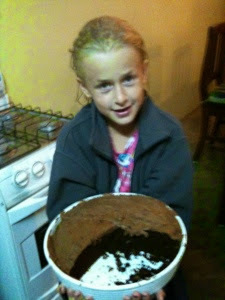 This week Esther made up her own recipe for a cake from scratch at age 8. It is delicious! She calls it "healthy cake," not because it is healthy, but because she thought I would be more likely to let her make and eat it if it was called healthy. But I know the ingredients, so I know better. Here is a photo of Esther after her shower holding her cake. Doesn't it look healthy? Yesterday Esther and I were invited to go have lunch in a nearby village by a friend who works at GSF. She has 2 daughters who are ages 5 and 3. Many American girls probably go to friends' houses for lunch, but this experience was very different. We were going to walk with Sylivia and her daughters to their house, so we met them at the GSF gate. We were meeting at 12noon. Since this is Uganda, we arrived at about 12:20 thinking we might see her around then. At about 12:30 I asked the guards when to expect her and they told us after 1pm. We went home for about 30 minutes, and then came back. Sylivia was running late because she had been helping her grandmother by fetching water and firewood. At about 1:15 we began walking uphill to her village. Many children followed as it is unusual to see a mzungu (white person) walking in the village, and particularly unusual to see a mzungu child. Esther walked hand in hand with Mariam, Sylivia's 5 year old. We had to move off the road often as many Bodas (motorcycles) passed. After some good exercise, we arrived at their room. As we walked Sylivia pointed out that she had recently shifted (moved) from a previous place that had a mud floor since their mattress was getting wet a night during the rainy season. Her new place had a concrete floor and a sheet hanging to separate the sleeping area from the living area. Sylivia and her 2 girls live in this 8'x 8' room. Many of the children from the village gathered around as we entered their place. The children sat around outside, some with clothes, some without, some with distended bellies from malnutrition. Sylivia was a very gracious host, she walked to a nearby store to buy rice and biscuits and sodas to serve us. She cooked up her remaining onions and tomatoes with the rice she bought to feed us lunch. At about 3pm she served us a lunch which was a huge plate full of rice and vegetables. She poured water that she had carried on her head for us to wash our hands and to drink. She also gave some of the rice and vegetables to the children of the village. I know that she was being so generous to us, so we ate and were thankful, but I struggled with knowing that I could go without this meal and those children outside were hungry. It would have been considered rude and ungrateful for me to take this food that she had prepared for us and give it to others, but that is what my heart was wanting to do. While Sylivia was outside cooking over her charcoal pot and running to the store, I was inside with Esther and Sylivivia's girls. 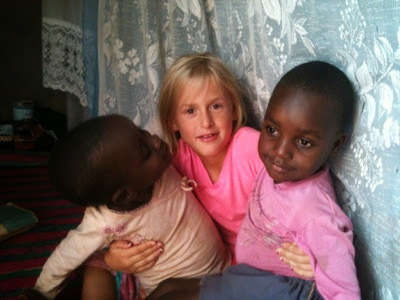 They speak very little English and we speak very little Luganda, but the girls managed to become friends anyway. They played quite a bit. They also really enjoyed seeing themselves in pictures! They played that they were Esther's babies and she rocked them and carried them around. It was a fun time. After we had eaten all the rice we could hold, we gave them pieces of the "healthy cake" which we had brought to share. Sylivia and her girls had never had chocolate cake before. They seemed to enjoy it. After sitting and talking for a bit, we were getting ready to go home. She sent us with all of the fruit in her house as a parting gift and paid for us to have a Boda ride back to GSF. She runs or walks that every day, but was so generous to pay for us to have a ride. I have been amazed and overwhelmed at the generosity and hospitality of the Ugandan people. So Esther had her first Boda ride. Since we wear skirts we both had to sit sideways behind the driver. 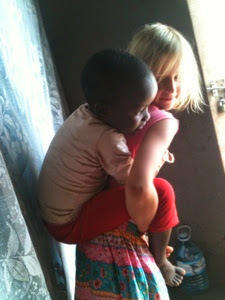 There isn't a lot of room, but Esther clung to me and I clung to the Boda, and we made it home safely. While Esther has some fun adventures here, she is also learning about life in developing countries. When we got home she began thinking about what of her things she could give to the girls and their neighbors. I am thankful that God has given Esther a heart of generosity and a love for those around her. I am hoping that she will continue to grow in love as she relates to her brothers. Thank you for your prayers for our whole family. God is teaching us all many things through our time here in Uganda.